Product prices and availability are accurate as of 2019-04-14 00:38:06 EDT and are subject to change. Any price and availability information displayed on http://www.amazon.com/ at the time of purchase will apply to the purchase of this product. In this Network Technology and Security Fundamentals training course, expert author David Miller teaches you how to secure and protect information as it flows across an enterprise network. This course is designed for users that are working in or looking to move up in the field of Information Technology. You will start by reviewing the Open Systems Interconnect (OSI) model, then jump into learning the TCP/IP suite of protocols. David will then cover transmission media and technologies. This video tutorial will also look at the devices that make up the network infrastructure, including firewalls, routers, Virtual Private Networks (VPNs), client systems, and virtual machines. 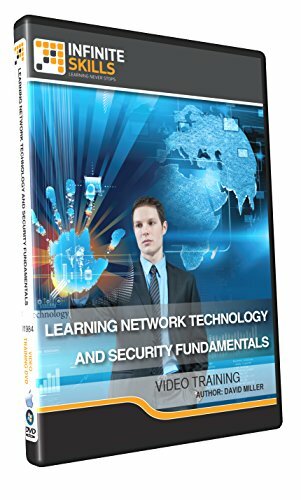 Next, you will learn about wireless networks, devices, and security. Finally, David will cover the various types of attacks on networks, including browsing attacks, information theft, and attacks on cell phones. Once you have completed this computer based training course, you will be fully capable of securing and protecting an enterprise network. Working files are included, allowing you to follow along with the author throughout the lessons. Learn Network Technology and Security Fundamentals from a professional trainer from your own desk Visual training method, offering users increased retention and accelerated learning Breaks even the most complex applications down into simplistic steps.